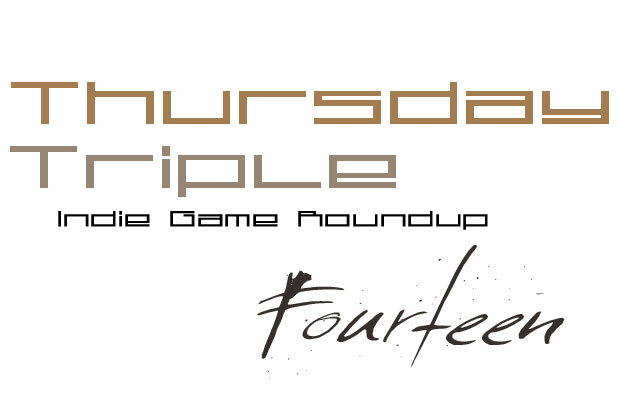 Thursday Triple is a weekly roundup of Indie Games from around the Net. I’m so ill. This flu has struck me down with the force of a semi, and only through the consumption of dish-soap-tasting liquid concoctions have I been able to face the blinding wrath of my computer screen. Of course, since I’m a masochist, the first games I turned to upon being well enough to play were runners and roguelikes with a dash of sardonic humour on the side. Ah, runners. They’re such a guilty pleasure of mine. If I ever need to kill a couple of minutes, whether it’s waiting for my noodles to finish cooking or for the bathroom to free up, there’s no other subgenre that lends itself to quick sessions as much as runners do. Rage Runner in particular takes the thrill of narrowly avoiding obstacles at breakneck speeds and combines it with a rocking dubsteb soundtrack. The levels are crafted to fit the music so you’ll really feel it when you fall into that ever-elusive flow state. Your ship can take on powerups, and by rolling side-ways you can make yourself fit through impossibly tight corridors. You can’t help but feel like a total badass slipping between walls of spikes or blasting through steel doors. Just based off what I’ve seen, there’s probably a Death Star waiting at the other end of the tunnel. Rage Runner is available on Steam for $4.99. For something (slightly) less rage-inducing, there’s FPS dungeon-crawler Heavy Bullets. Your goal is to reach the centre of a maze where you’ll need to reset the security mainframe in order to stop these (adorable) neon beasties from taking over the place. The only thing is, you’ve got one gun and six shots. Bullets can be picked up and reloaded, but each has to be done manually. Sound unforgiving? It is. So take your time with every area, and make sure your hand is steady. You’ll probably still die a lot, but thankfully there’s insurance for that. Items discovered along the way can be used to suit your playstyle. I’ve yet to figure out how the listed high heels are of any benefit though – the only thing stilettos are good at, aside from making butts look fantastic, is when you really need a pointy weapon. Heavy Bullets is available on Steam Early Access for $9.99. Nothing like some human-belittling robots to brighten your day. From Freaking Meatbags comes an RTS where splicing DNA is not only allowed but encouraged. You’re a little cleaning robot tasked to gather resources before the end of the solar system, and you’ve taken meatbags along to do the menial chores you don’t want to. It’s a base-building game with your structures and upgrades, wrapped in an art style that fits its quirky humour. For the actual subject matter and RTS-nature, it’s rather light-hearted. Just lost some soldiers? Ehh, time to breed some more. I’ve fallen in love with these robots. They’re just so charming. There’s also apparently a giant, trans-dimensional space squid. I do find the most random facts to fixate on. Freaking Meatbags is available on Steam Early Access for $9.99. Executive Editor of ManaPool. A student of game design, Amber is currently writing from the frozen north that is Canada. She has a penchant for tactical team-based games and a particular taste for theorycrafting. Want to discuss community and player experience? Talk to her!